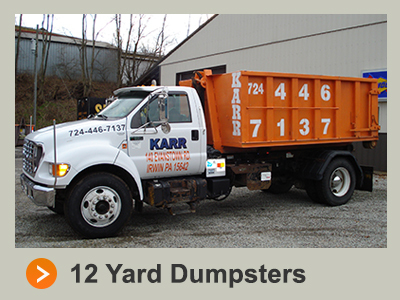 Our Family Owned Dumpster Service offers 12 yard dumpsters for residential and commercial projects. We provide service that is prompt, professional, and courteous. We deliver right to your location and pick up as soon as the job is completed. Price includes delivery, pick up, and disposal up to container capacity. Discount prices on quick pick ups. We are located in the Pittsburgh - Greensburg area of Sewickley Township adjacent to the communities of North Huntingdon Township & Hempfield Township. We have permits/licenses for Allegheny, Westmoreland, Fayette and Armstrong Counties.